The Hiyu, a Puget Sound bound car ferry built by Gunderson Brothers Engineering Corporation, was launched in Portland on February 24, 1967. The Hiyu is only the second important ferry built in Portland in 20 years. The other was the 172-foot M. R. Chessman, built in 1948 by Albina Engine & Machine Works, Inc., for the Astoria-Megler service. It was retired last year when the new bridge was opened for services. 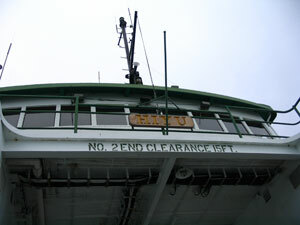 The Hiyu started out on the Point Defiance-Tahlequah, Vashon Island route, and served admirably on several route until the late 90s, when she was mothballed . . . or so we thought. She was re-activated in 2007 and continues to ply the waters between Point Defiance and Tahlequah. Credit: Hiyu photo by Jim Carson on Flickr, used under Creative Commons Attribution-NonCommercial-ShareAlike 2.0 Generic license.